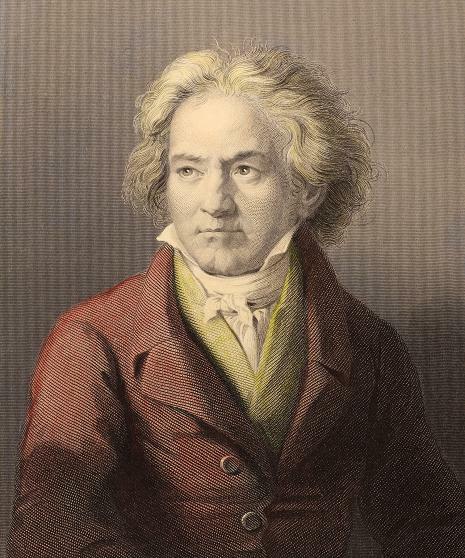 Beethoven has achieved iconic status as a composer. In the musical community, this position has been achieved due to the immense, even revolutionary, influence he has had on the development of music as the pivot point from the Classical to the Romantic eras. His symphonies in particular demonstrate this development, themes from the 5th and the 9th being instantly recognisable, the latter used as the European Anthem. His image is also well-known among non-musicians, with his features of intense concentration and unruly hair. Beethoven's deafness has served to underline this position as icon, both because it makes his achievements seem more remarkable, but also because it emphasises the popular picture of a composer whose inspiration comes from within, those inner thoughts and sounds are elaborated and pieced together into the most intricate musical canvas. Beethoven was born in Bonn in Germany and, like Mozart, into a musical family whose father and grandfather were both singers. Though not to the same extent perhaps as Mozart, he was also a musical prodigy, whose father had taught him music at an early age (and some say bullied his son to further his own ambitions), and this education was continued by court musicians such as Neefe. His early talent was demonstrated particularly at the keyboard, as pianist, organist and harpsichordist, although he also showed talent on the violin. He studied composition with Haydn and other composers of the day, also reputedly receiving some tuition from Mozart after moving to Vienna, and his early works are not too far removed from the output of Haydn and Mozart. However Beethoven was not content simply to follow in the footsteps of his predecessors. Following on from those early works, his style diverged rapidly from his peers and teachers. Revolution was in the air, both politically and artistically. His 3rd symphony (huge in duration for the time) was originally dedicated to Napolean, but Beethoven erased his name from the title page on discovering that Napolean had declared himself Emperor. Although he still produced shorter symphonies like the 4th and 8th, each new symphony explored new areas. As well as symphonies, Beethoven wrote extensively for the String Quartet, perhaps again following in the footsteps of Haydn. His later quartets, at times very personal introspective works, also spread far into uncharted musical yet intimate territories. He wrote various other chamber works, several overtures, concertos, a Mass, an opera called "Fidelio" and a ballet called "The Creatures of Prometheus". He also wrote extensively for the piano with numerous sonatas and 5 concertos for that instrument, as well as some sonatas and a concerto for the violin, and a "tiple concerto" for violin, cello and piano. Symphony No. 9 in D minor, the "Choral" symphony whose last movement is a huge extended set of variations on a setting of Schiller's "Ode to Joy" sung by four soloists and a chorus. Here are arrangements of the "Ode to Joy" Theme arranged for piano solo and bassoon and piano (including alternative sheet music for many other instruments in place of the Bassoon). "Pathétique sonata" with its famous 2nd movement. This is also available on mfiles arranged by Artur Akshelyan for viola and piano and for clarinet and piano. In total Beethoven wrote 10 violin sonatas (for violin and piano) and 5 cello sonatas (for cello and piano). Here is the first movement of his 1st Violin Sonata (with parts for violin and piano). 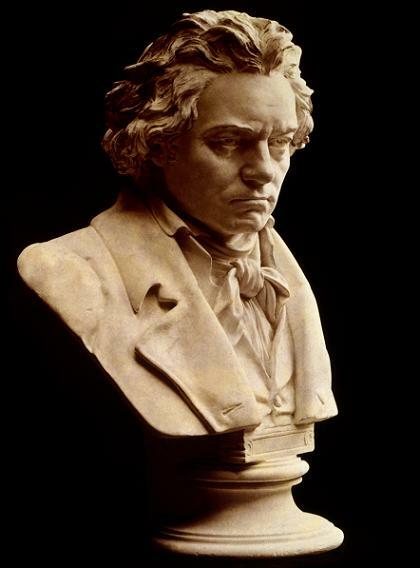 For his single opera "Fidelio" Beethoven wrote a number of overtures before he was happy with the result. The other overtures are often played as concert pieces and one of those (called the Leonore Overture No.3) contains the following Trumpet Call which we have included in our article about Bugle Calls. We've mentioned that Beethoven learned much musically from his teachers. He also learned much from studying Bach's works, such as the 48 preludes and fugues, and it is interesting to see how Beethoven employed fugal writing himself within his symphonies as a form of development (see for example the slow movement of the 7th symphony again). However, although Beethoven had a number of musical influences, in some ways that is not the most important aspect of his creativity. 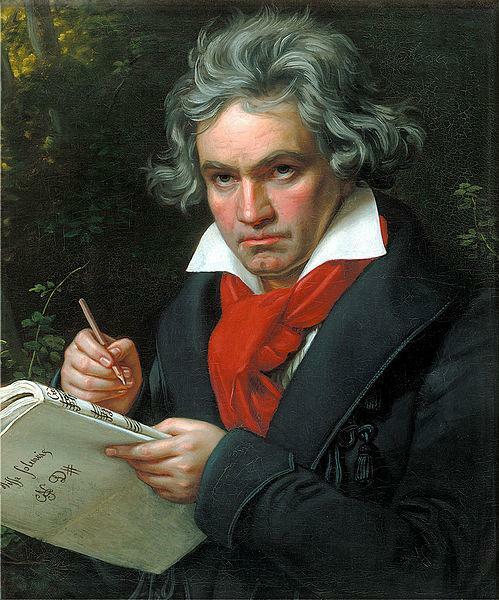 Rather in many ways it was his own thoughts, feelings and ideology which he strove to commit to musical form, and it was this which singled Beethoven out as the first of the great Romantic composers. But his thoughts and ideology didn't arise out of nothing. Beethoven was influenced by other artists, writers, poets, politicians, philosophers and other great thinkers of the day. It was his own thoughts on these topics which more than anything seemed to drive Beethoven's creativity. Prior to this time, composers were typically employees of state, church or wealthy titled patrons who requested works to suit various important occasions whether secular or religious. In contrast Beethoven, like Mozart, was an independent creative artist who to some extent could set his own agenda. This agenda may have been fuelled in some more intimate works by his several failed love affairs and knowledge of his growing deafness, but other grander influences (particularly in his 3rd, 5th and 9th symphonies) were ideals of liberty, republicanism, religious beliefs and the brotherhood of man. Beethoven's method of working was to record ideas in numerous notebooks, which sometimes he would mull over for years, before eventually developing them into the building blocks of his compositions. So for example the seeds of the theme which eventually became the Ode to Joy, was originally conceived more than a decade earlier. This suggest a long gestation period and supreme attention to detail in order to depict in music the strength of his idealism. It is almost as though the notebooks were a private extension of his thoughts and ideas and memory, that he would record, and later shelve, adapt or develop, but not commit to paper until he had mapped out a more thorough outline of a whole work. Even then Beethoven's surviving manuscript scores are full of corrections where the composer has scored out an replaced sections of music. And there are also examples of Beethoven correcting the output of copyists who have tried to interpret his handwritten scores. This creative process and the path he initiated was followed and extended by many other composers of the Romantic era, including composers as diverse as Brahms, Wagner, Mahler and many others. 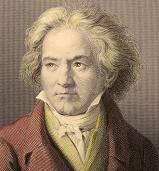 Beethoven: At the Piano, 9 Well-Known Original Pieces in Progressive Order from Sheet Music Plus. Complete Piano Sonatas Volume 1 and Volume 2 from Sheet Music Plus (US). Symphony No.5 - complete miniature score from Sheet Music Plus. Symphonies No.5, 6 and 7 - full score Dover edition from Sheet Music Plus.